One of the items on my Spring To Do-List was to unclog our bathroom sink, which was draining slow. This past weekend, I set out to clear it up and was able to do so with the use of just a few items. The drain has been running slow for quite some time. It never got fully clogged but didn’t seem to drain really fast. Every couple of months, I would use some Drano Max Gel remover, and that would clear things up a bit, but I could tell it never fully did the trick. Plus, each application seemed to buy less and less time between usage, so I knew it was time to tackle the problem head on. I used a couple of the rags to plug up the overflow holes at the top of the sink as you want to create a vacuum seal with the plunger. I wet the rags first before plugging them to give a better seal. 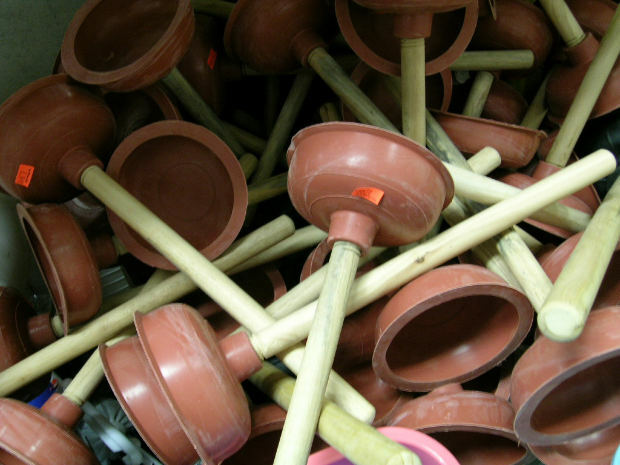 Run the water – I first attempted to use the plunger with a dry sink. All this did was pull the sink drain closed. Running water prevented this from happening. Create a seal with the plunger over the sink drain. I did not find it necessary to remove the drain stopper (see step above). I’ve seen other sites recommend putting a little petroleum jelly around your plunger if you can’t get a good seal, but I didn’t need to do this as the small plunger I purchased for $2.50 fit perfectly. 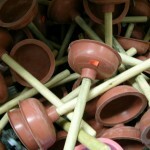 Push up and down on the plunger at least ten or twenty times with strong force. Prepare to be disgusted! Some of the stuff that flowed back up into the sink was disgusting. It was obvious that the grime and stuff lining the pipes had been accumulating for awhile. At this point, there was so much grime and who knows what else raised that it actually fully clogged the sink. My guess is that it probably pulled so much grime which then settled in the drain trap that it created a full clog. Further plunging and rinsing did nothing to reduce the water level or the mess that had now been brought forth into the sink. I decided to try the Drano Max Gel to see if it could clear things up. Even though there was water and gunk in the sink, I attempted to pour it lined up with the drain so that it could get down in the drain and start working. Sure enough, I could see the water level dropping slowly and then suddenly it broke through and drained fast.Note: The bottle of Drano makes it very clear that if the clog doesn’t go away, you are not to use the plunger anymore afterward since this could result in splashback of the Drano product, which could result in burned skin and other bad things. So, if you get to this step and the Drano does not remove it, STOP! You will then need to remove your drain trap from underneath the sink. Here is a link that shows how to do that, but I won’t get into details since I didn’t actually need to do this step. After the Drano Max Gel did it’s work, I ran hot water down for a couple of minutes to remove all signs of the Drano Max. I wanted to make sure that everything was cleared, so I went back up to step 2, and re-ran steps 2-6. There was still some gunk that came loose that I was able to pull loose and rinse down, though it wasn’t enough to clog the sink again. After a couple of more rounds, the plunger didn’t backwash anything nasty into the sink. I kept the hot water running to make sure to let everything flow all the way down the line. I noted that my sink now cleared water at an astonishing rate! I thoroughly cleaned the sink using the rags I had previously used to stop the overflow drink since it needed a cleaning to make sure all the nasty stuff that had backed into it were gone. Once all traces were removed, I put everything back to normal! The whole job took about 15 minutes from start to finish. I had been afraid that I would need to open the drain trap which could take a lot longer and be a lot more messy, but luckily I was able to avoid that. A plumber would have probably charged $100 to do the same work, so I felt pretty pleased with my work and my results! I've used this trick myself. Although instead of Draino or the like, I've started using a more natural products — baking soda, vinegar and boiling water. Pour a 1/2 cup of baking soda down the drain (if it's just a slow drain and the sink is empty of water), and follow up with a cup of white vinegar. Follow that up with a pot or teakettle full of boiling water. I've found this helps with many slow drains. I do the same as RainyDaySaver twice a year to avoid having to go through the declogging process. I did similar. Except that I did a concrete counter top project.. and I got concrete bits in the sink… opps. That took a while to clean out, but I eventually got it all out. With previous clogs I sometimes found I needed more than one bottle of drano. Letting it sit for a while did the trick and eventually cleared it out for me. Concrete would definitely not be a good thing. I had tried and tried Drano and it didn’t work for more than a week. 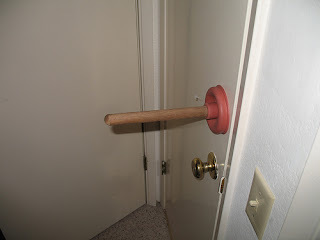 Since the plunger work, it’s been pretty free and clear!